Happy Holidays - Holiday Deadline: Orders placed by December 12th will ship by Dec. 19th. 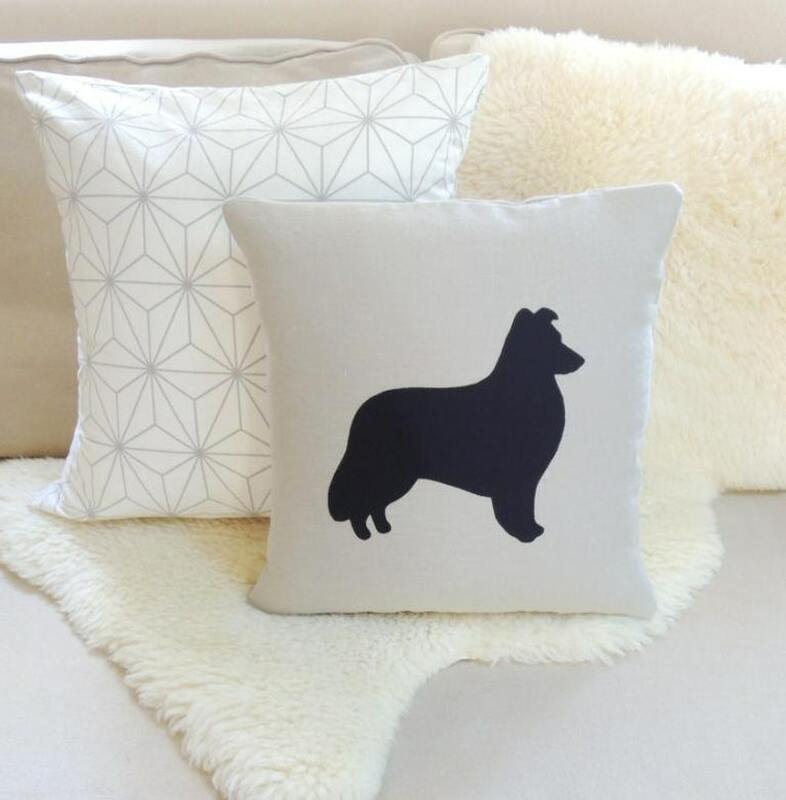 This Sheltie appliqué pillow cover celebrates your devoted pup and adds a stylish accent to your interior space in flax beige linen and classic black. This dapper pup makes a striking statement on a sofa, in a chair, propped on a bed or greeting your guests on an entryway bench. A facing pair makes a striking statement on a bed or sitting pretty individually in a pair of chairs. 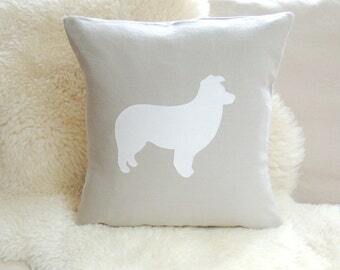 Choose the Shetland Sheepdog silhouette in black, ivory (photo 3), charcoal gray or white. About the collection....A modern take on traditional appliqué, each pillow cover is an original design, hand-cut and sewn with meticulous attention to detail and quality; no plastic felt, paint, die cut machines or polyester screen prints manufactured by a third party here! Fabric: The background fabric is European linen with that fabulous rustic luxe texture. Each silhouette is hand-cut and machine finished with a coordinating zigzag stitch for a polished silhouette. Seams are double-stitched and secured with a zigzag stitch for a durable, professional finish. Fully lined. French style envelope closure for easy removal. For your holiday decorating, check out the dog silhouette stockings personalized with a monogram; a fabulous keepsake for your pup's first Christmas! Sheltie Dog Silhouette Pillow Cover. Design & Images © Vixen Goods. All rights reserved.